Start focusing on your fitness now with the Marcy Olympic weight set workout bench. 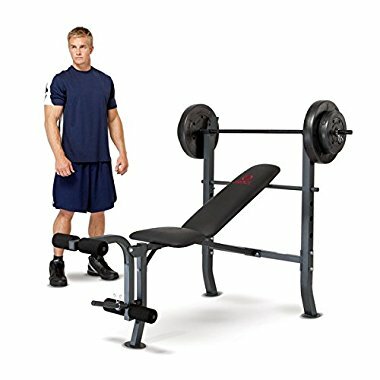 This adjustable weight bench features an 80-pound weight set and five bench positions for all of your seated strength training exercises. The heavy duty steel frame of this workout weight bench has a capacity of 300 pounds. Store: The Montgomery Group Condition: Brand New Price: $260.38 Total Price: $260.38 Buy It from The Montgomery Group Want it delivered by Monday, April 24? Last updated: April 18, 2019 at 11:42 EST. Pricing information is provided by the listed merchants. GoSale.com is not responsible for the accuracy of pricing information, product information or the images provided. Product prices and availability is subject to change. Any price and availability information displayed on amazon.com or other merchants at the time of purchase will apply to the purchase of the product. As always, be sure to visit the merchant's site to review and verify product information, price, and shipping costs. GoSale.com is not responsible for the content and opinions contained in customer submitted reviews.